Enhance your bathroom by ensuring that the mixer technology stays in the background. Not only do pipelines and connections that are concealed in the wall improve the look of the bathroom, they also create more space to move around. Ultimately, a concealed installation with the Hansgrohe iBox offers an enhanced showering experience, a streamlined look and more space to move around in the shower and around the bath tub. Moreover, the iBox universal makes renovations easier: the base set, which is installed in the wall, is compatible with all standard mixer ranges from Hansgrohe and AXOR, and makes replacement of the control units really easy: the iBox universal is simply "One fits all". 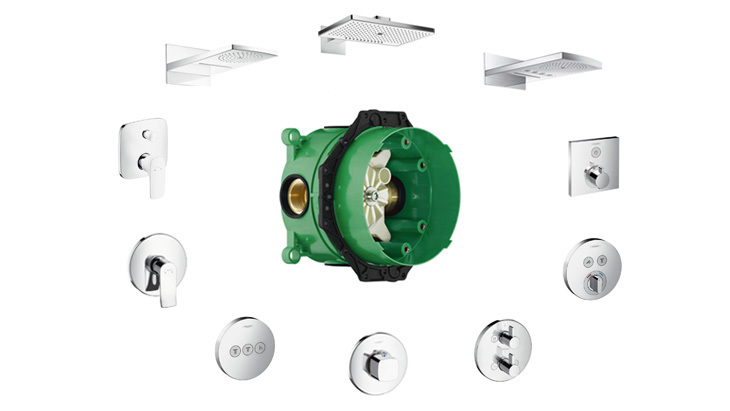 Private building owners and bathroom renovators can therefore enjoy planning flexibility: install the iBox universal basic set today and select the mixer design or a multi-jet overhead shower to combine it with later on, in your own time. Based on the iBox universal, an existing application can even be adapted to changing requirements. The flexible concealed installation technology prevents the wall from having to be chiselled out again later. The Hansgrohe website for sanitation professionals offers more information about the iBox universal.